Robert John Schleiger, 75, of Loveland died April 3, 2010, at home with his family at his bedside. He fought a courageous battle against cancer. Bob was born to John and Christina Schleiger on June 13, 1934 east of Berthoud, CO. 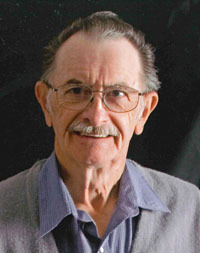 He attended Whipple School east of Berthoud through seventh grade and then graduated from Berthoud High School in 1952. He lived on the farm while growing up and enjoyed working with the land and the animals. He met his wife Arlis Falls during his senior year in high school and they were married on February 28, 1953. He and Arlis had two children, Robert Jr. and Christine. Bob worked for 31 years in the heating and air conditioning business, working for Gibson Heating, Simpson Sheet Metal and U.S. Engineering. He retired in 1987, and they traveled a lot, both in their car and their 5th wheel trailer. He enjoyed his retirement years and also did extensive work on genealogy of both of their families. He belonged to the Germans from Russia Organization and had family trees from both his mother’s and father’s families. He also loved working in his yard and had a lot of beautiful flowers, especially roses. Preceding him in death were both of his parents; his sister, Marjorie Schaal; and his mother and father-in-law, Mamie and Cecil Falls. Bob is survived by his daughter and son-in-law, Christine and Gil Vincent; his son and daughter-in-law Robert Jr. and Christina; and six grandchildren: Rhiannon Ryan (Sean), Bryan Vincent (Angie), John Schleiger (Alison), Eric Vincent (Jennie), Jesse Schleiger (Stephanie), and Katie Sykes (Will). Also survived by eight great-grandchildren: Skyler and Seanna Ryan; William, Anna and Colton Vincent; and Torin, Jory and Channing Schleiger. He is also survived by a brother Kenneth (Ginger) of Berthoud; three brothers-in-law and a sister-in-law; three aunts: Pauline Sterkel, Leona Hutton, Lorene Hartung; and several nieces and nephews. Funeral services will be held Friday 10:30 a.m. at Faith Evangelical Covenant Church, Loveland, with interment at Greenlawn Cemetery, Berthoud. Reception following interment in the Hall of Faith at Faith Evangelical Covenant Church. Viewing Thursday 5 to 8 p.m. at Viegut Funeral Home. Memorial contributions may be made to Pathways Hospice or American Cancer Society in care of Viegut Funeral Home.